Sarkozy is eliminating history/geography from France's school curriculum. Not surprisingly. History does not serve him. In the USA, while history is taught in order to gel a sense of identity around the country's originating myth, geography is ignored. Could be unpleasant if Americans got too nosy about the blurry world beyond their borders. 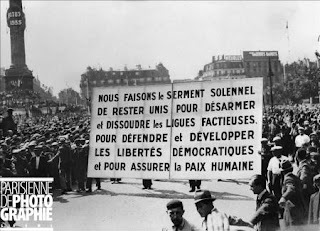 Similarly, the historical past of France is a dangerous precedent to refer to: Revolutions in 18th and 19th Century, La Commune (control of Paris by its working class in 1870), Le Front Populaire (workers movement in the 1930s), May 68, etc. Below a small passage from "London", a semi autobiographical text about my years in Thatcher's capital in the 80s. "Our individual pasts slip gently into oblivion, after two or three generations. Mine, as I revisit it, is melting with history: the Thatcher era. The power of the intellectual elite is weakening. When the middle class ruled, they needed to reinforce the principal source of their wealth: knowledge. There is no knowledge without memory, without a past. Now that money has supplanted middle class and its culture, it is in corporations' interest that historical landmarks such as unions, human rights, freedom, equality are forgotten. Will history survive? Will anyone still take an interest in us? Will archeologists dig up Camberwell, looking for artifacts from 1980's squatters?"